Melanie loves school, and she loves her teacher, Miss Justineau. Yet, a school day for Melanie involves being strapped into a chair at gunpoint, restrained through all of the lessons. Regardless, Melanie thrives, soaking up knowledge and stories and culture. Soon, Melanie will have to act on her knowledge, and her actions may change the world. A brilliant coming of age zombie novel. Who knew there was such a thing? Zombies seem to be the creature of choice today, where once vampires definitely took top billing. The Walking Dead, World War Z, Zombieland, Warm Bodies–all zombie stories. Most zombie stories don’t have a happy ending, due to the nature of the beast. Zombies eat your brain and make more zombies, after all. 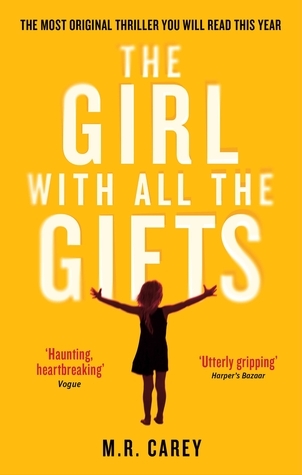 However, in “The Girl with All the Gifts,” we have different take on zombies. Zombies may have ended the world, but one young zombie girl may be the start of a new one. I really can’t say more, but Mike Carey, the author, has written for Hellblazer, Marvel’s X-Men, the Fantastic Four, and Neil Gaiman’s Neverwhere comic adaptation. He has great skill in not only writing a good zombie story full of great action, but he gives us very strong characters as well. This is an excellent book, and one I highly recommend.